With the boom of social media over the past few years, everyone’s trying to make the next viral video. We mean online videos that they hope can go viral. But what does it take to truly make a video viral? And is view count the only factor that makes it go viral? There are some videos with high view counts, but hardly a talking point in the commentary section. So it begs the question if the high viewership is organic, reliable or simply just another by-product of a force-watch ad. More than one month ago, we had the privilege to work with Chope, a real time restaurant-reservation booking platform. Looking back now, our client themselves was part of the formula why the commercial we have done together went viral. It is never easy to sell an idea especially one you think may go ‘viral’. These days, videos with influencers/celebrities can tremendously help a video get its attention “hit the desired/targeted viewership number”. For this commercial, we had none of this. What we had was just a last minute idea I came out with for the pitch. Truth be told, as a film director it is already a tricky thing to create something you want people to watch for a commercial. Even harder on a online feed that is updated every second. What is the trend now? What would get people’s attention without crossing the line? Or what relates to people? How do those Thai commercials do it? How do you make it your own? I came up with three ideas for the pitch and I thought, it wasn’t bad but it ain’t great either. On the way to the meeting, I just kept thinking what could be better, simpler and easier for people to understand and have a good laugh about it. So this idea came along. A couple’s quarrel over a long wait for food would be hilarious to watch since most couple experienced it themselves before. It’s stupid, ridiculous, but it can literally kill a relationship. 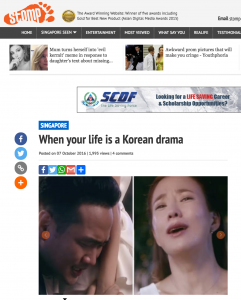 It’s that dramatic… Why not make it even more dramatic like the Korean dramas? It can’t be based on our local drama if you know what I mean. This is the kind of moment when you know it just works. We were very blessed to have Chope believe in the concept as we did. There were no changes made to the shootboard we presented! The next important element lies in casting. We were specifically looking for Koreans to bring out the authenticity of a K-drama. It was especially challenging since we’re in Singapore. Thanks to Faces Talent Management, we managed to cast the right talents, Khoo and JiOh. While JiOh is an experienced actress, Khoo is relatively new to acting but has the charisma the client and I was looking for. Therefore, I went through rehearsals with the talents before principle photography to make sure it was going to the direction I wanted it to be. Once we had everything in place, all we needed to do was to bring the idea to life. The next thing we knew was the video went viral in a week organically. 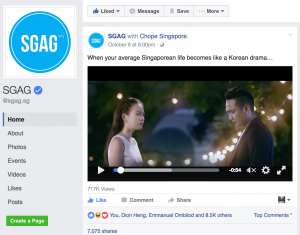 It was on SGAG, Stomp, Coconuts and Facebook pages shared around. Altogether, the video has more than a million views today and most importantly, people were talking, laughing, commenting, sharing and poking fun at their partners about it. It was relatable even to those who do not follow the Korean wave just like me. Some even thought it was a new trailer for a Korean movie, the other little twist we intended for. This is no doubt one of the jobs we’ve enjoyed working on by far this year. 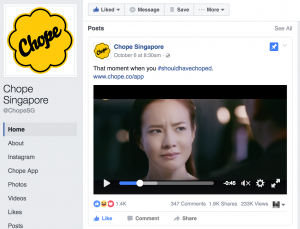 We thank Chope once again for giving us this rare opportunity to truly create and for trusting us. Here’s to more good scripts and ideas. Even the ones from a spur of the moment.